Tramps like us, baby we were born to bid. A handwritten, working lyric sheet for Bruce Springsteen's 1975 hit "Born to Run" sold for $197,000 on Thursday at Sotheby's. The document used to be in the collection of Springsteen's former manager, Mike Appel, according to Sotheby's. It did not reveal the identity of either the seller or the buyer, a person bidding by telephone. Most of the lines in this rough 1974 version, written in Long Branch, N.J., are apparently unpublished and unrecorded, but the manuscript does include "a nearly perfected chorus," the auction house said. The title track of Springsteen's 1975 album has revved up generations of fans — some of whom still refer to themselves as "Tramps," like in the song. / like us baby we were born to run." There are also some notes in the margins — "Wild" and "Angels" and a word that looks like "velocity," with the letter "t'' in Springsteen's curlicue cursive. "Although Springsteen is known to have an intensive drafting process, few manuscripts of 'Born to Run' are available, with the present example being one of only two identified that include the most famous lines in the song," Sotheby's said. Springsteen's website describes the "Born to Run" album as "a sheer epic fueled by tangible energy, the idealized notion of escape and the romance of youth." His "Darkness on the Edge of Town" album came out three years after "Born to Run." For much of that interlude, Springsteen was prevented from releasing music due to a lawsuit involving Appel. Material from the "Darkness" sessions may have been influenced by the acrimonious fallout from their business breakup. "Darkness" was "noticeably sparer than 'Born to Run,'" according to the Rock and Roll Hall of Fame website, which says Springsteen described the evolution as "a certain loss of innocence." "If 'Born to Run' was epic cinema, 'Darkness' was brutal reality, its characters not dreaming of idealized escape as much as struggling against their circumstances," notes Springsteen's website. A lot of water has since ebbed and flowed under that bridge. In November 2009, Springsteen invited Appel and his son to fly with the E Street Band to their tour finale in Buffalo, N.Y., which featured "Greetings From Asbury Park, N.J.," an album Appel co-produced. At the show, Springsteen publicly acknowledged Appel's contributions to his career. 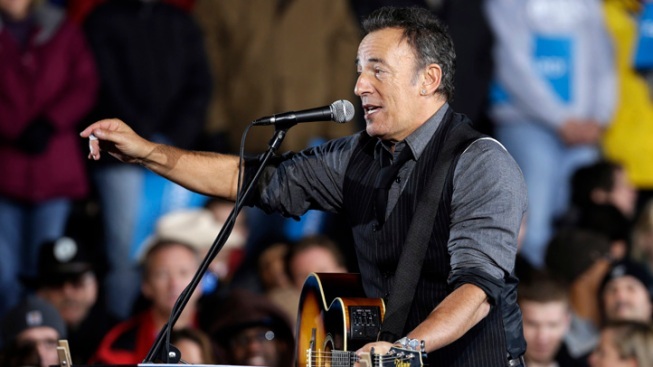 Springsteen told The Associated Press in 2010 that he and Appel were "very good friends." The "Born to Run" manuscript was included in a sale of fine books and manuscripts. It had a pre-sale estimate of $70,000 to $100,000.